I love heat, in fact I love a lot of heat. 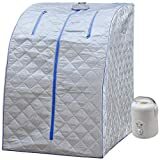 If you are like me then you probably dream of having your own portable sauna like a home infrared sauna or even a traditional sauna. 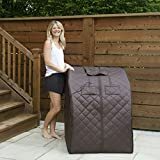 Unfortunately a traditional sauna is a little out there as it generally requires building work and a lot of cash so a personal sauna you can enjoy without the cost or space issues really is the best solution in most cases. 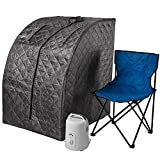 If you are looking for a larger 2 person sauna and have the space to put one check out our guide here. The first thing to know is that portable saunas look nothing like larger commercial or traditional saunas. They look like an oddly shaped space suit but don’t let that put you off. While the concept of this more compact personal sauna is not exactly new, having one that is portable is. Most of them fall into the category of being portable infrared saunas which are of course powered by infrared. You may have heard of infrared therapy which is a type of light therapy sometimes used as part of a treatment for tissue damage. 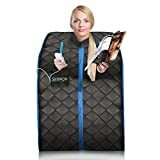 Having a portable infrared sauna is a little different. Put simply the infrared is a great and effective alternative to a traditional fire powered sauna. It is also very efficient so you can quickly use your sauna and do so without spending a small fortune. As you have probably guessed from the detail above we recommend the Serenelife Portable Infrared Home Spa.